I don’t know about you, but this winter is getting old. Old as in … just move along already and give way to my most favorite time of year, the season of renewal, of hope, of sunshine and warmth… spring. And what better way to kick Old Man Winter to the curb than through a luminous perfume that exudes its own sunlight and adds a lilt to your voice and a sashay to your step? Which was precisely where I was this wretched, rainy, cold March day when I remembered something in my Guilt Trip Review Box that just might be the one-way ticket away from all the months-long miseries caused by a seemingly endless winter of drab, dank and damp. Many flowers have laid claim to being the embodiments of spring; hyacinths, tulips, daphne, bluebells… it makes for a long list. Yet in spite of their many virtues and the perfumes that pay homage to them, perhaps none are so emphatically spring-like in their appearance or their fragrance as those tiny, fragile snow-white bells known as lily of the valley. The paradox about lily of the valley in perfumery is that the fragrance can’t be extracted from the flowers, so a lily of the valley perfume relies on a perfumer’s skill in building an accord to evoke it, whether that is by flower essences and absolutes and/or using hydroxycitronellal, Lilial or Lyral. For many, the ultimate lily of the valley recreation is Edmond Roudnitska’s 1956 Diorissimo, the one lily of the valley to rule them all, but Diorissimo and I – as indeed my opinion of lily of the valley perfumes in general – don’t get along at all. First of all, my mother wore it, which kills it for me stone cold. Second, although I adore the verdant fragrance of the flowers themselves when I find them, something about their interpretations in perfumes strike me as too virginal, too snow-white, too altogether frilly, hyper-feminine and white-tulle-with-added-meringue bridal for my personal tastes. Tauer Perfumes’ Carillon pour un Ange, henceforward referred to as Carillon. I’d read the many reviews of Carillon, read them with that instinctual frisson which informed my synapses that maybe, just maybe it wouldn’t be one of those virginal ingénues that sent this post-punk catastrophe running for the hills of the blackest, raunchiest, goatiest labdanums I could find. So it all magically came to pass that overly fragrant afternoon at the Stazione Leopolda, when the entire glorious lineup of Andy Tauer’s creations gleamed in front of me and the first one I reached for was Carillon. Muguet? Oh, yes. Lily of the valley and a whole supporting cast of viridian characters danced in on a silvery spring sunbeam that instantly blasted away the memories of most of the countless hyperluxe eau de niche perfumes I sniffed that day. I left the Stazione Leopolda thinking new and very modern thoughts about lily of the valley. Such as… I want a bottle of this, pronto per favore. Not to mention: This! Is a lily of the valley I can actually love. And wear. And not feel like Bridezilla five minutes before walking down the aisle. When Andy Tauer kindly offered to send me samples some long time later in another context (his re-release of the bottled summer known as Cologne du Maghreb), I remembered Carillon, remembered that moment and asked for Carillon, to see if my recall had been correct. The day it arrived, I sprayed it, swooned to be back in memory at least to that afternoon in Florence, put my Tauer tin in the Guilt Trip Box… and forgot all about it until today, as winter writhes its last throes outside in the rain and the wind huffs and puffs against my windowpanes, today when I am desperate for a breath… of spring. If you could assign a color to spring, surely it would be the tender sunny green of leaves about to burst? So it is with Carillon, right from the opening peals floating on the breeze right above my skin. I detect a smidgen of rose, certainly lilac and a suggestion of a dense, oily-green hyacinth, although hyacinth isn’t listed among the notes, but above all, clear as the bells of the flowers themselves is this lily of the valley, no ingénue but instead an olfactory interpretation of the flowers, the stalks and leaves, the cool snap of sap and the rise of sunshine, as much as to sing… wake up, wake up! Winter is dead – long live spring! Long may it reign, and indeed it does once these bells hit their stride and grab the airy, verdant jasmine for a Viennese waltz on the lawn in the sun and around and around they go. Ylang ylang, which is listed on the Tauer website as a topnote, doesn’t make an entrance on my skin until well into the heart and then only as a discreet sugar dusting to balance the green and banish the bitter. Off they all waltz into the sunset of a flawless spring day across that emerald lawn, echoed by a soft step of leather, moss and ambergris that is nothing in the slightest like the Tauerade you think you know. 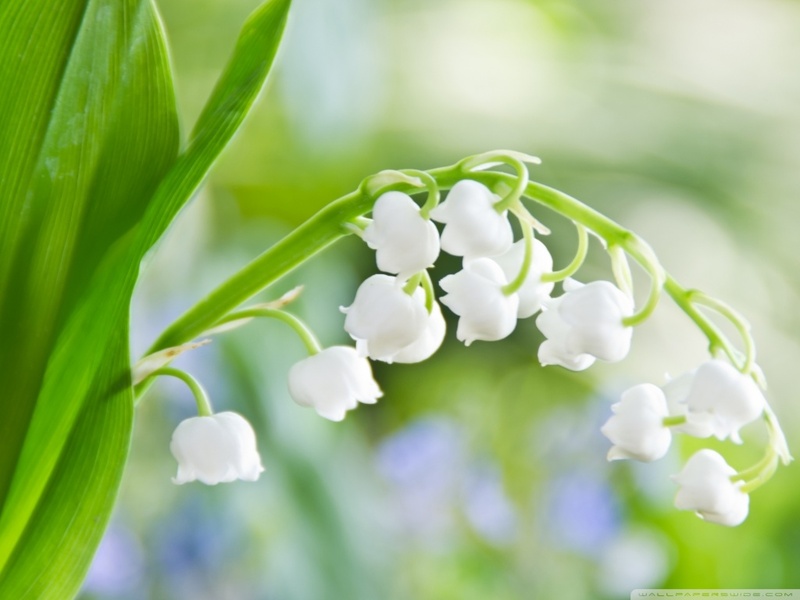 In flower symbolism, lily of the valley symbolizes the return of happiness. If that is an omen – just as I was reminded of Carillon on a dire, drab day of doom and despair this winter will ever end – then I’ll take it, thank you very much. Or else I’ll take it as a sign that spring will – all momentary appearances to the contrary – indeed return and happiness, too, so long as I can ring in the clarion call of spring with this peal of bells for an angel (or a mortal!) called Carillon pour un Ange. Notes for Carillon pour un Ange: Rose, ylang ylang, lilac, lily of the valley accord, jasmine, leather, ambergris, moss woods. Carillon pour un Ange is available at Luckyscent and directly from the Tauer Perfumes’ website. Disclosure: A sample was provided for review by Andy Tauer. For the sample, for his support, encouragement and for his astonishing patience, I thank him profusely. My reviews and opinions are my own, for which see my review disclaimer here. Also a big thank you to Monica Miller, who reminded me. Certain things are a given in summertime. You can reasonably expect to survive the heat of July with a) a few mosquito bites, b) by moving from one shady spot to the next if you’re anything as fair-skinned as I and c) last but never least, by rejecting most of the contents of your perfume cabinet in favor of lighter, flirtier scents, unless of course you’re also like me and suffer a fit of heatwave-induced contrariness and roll out what my friend Ms. Hare calls ‘bombs’; those take-no-prisoners odes to opulence that do wonders for your mood if not for your 12+ hour sillage trail. Today, dear readers, will not be one of those days. For today in my garret in Niflheim, it is an already warm, blue summer day with the promise of more heat on the way. It won’t be long before I turn on the fan and place it on the floor to the delight of Hairy Krishna and Janice Divacat. All my windows are as open as they can be with two cats under a rooftop, the blinds are down to keep out most of the heat and as I type these words, my hair is up in a clip and my iPig is blaring a favorite baritone. I am wearing precisely one item of textile since it’s far too hot for anything more – a tissue-thin A-line rayon dress that won’t make the mailman blush too hard should he arrive, but it’s the coolest item of clothing I own and I have no air conditioning apart from my fan. Today is also the day I reach for a small vial I’ve been meaning to review for quite some time – Andy Tauer’s recently re-released Cologne du Maghreb, which was originally a 2010 limited edition he has now made part of his permanent collection. You could argue that the European perfume industry as it exists today owes everything to the cologne – that refreshing if fleeting blend of citrus, flowers and herbs that has been applied to everything from skin to hair to babies, and even used as a mouthwash since Giovanni Maria Farina hit upon a lucky blend in 1709 and named it for his new hometown of Cologne in Germany, an homage also to the local belief that the waters of Cologne cured everything that ailed you, bubonic plague included! If this eau de cologne by the great Andy Tauer (one of my Primeval Forces of Perfume) is another panacea for all things heat-related that plague me, then it can’t possibly hurt to try. If colognes – at least, the ‘classic’ variety embodied by brands such as Roger & Gallet or 4711 – strike you as uncomplicated, somewhat linear fragrances to mindlessly revive your melting self beneath a molten sun, then I have news for you. Cologne de Maghreb is not one of those. Surely, we perfume diehards hoped for no less from the august Andy Tauer? And just as we hoped, dear Andy delivered. For his Cologne du Maghreb is neither simple, uncomplicated nor linear in the slightest, yet it is very much a cologne, meaning it is as invigorating as a dip in a cool swimming pool (I can dream!) yet also every drop as sophisticated as all his perfumes. It begins, like so many great perfume tales, with a blinding bright sunshine burst of lemon and bergamot. And I do mean… lemon. Lemon with a capital L, lemon with all its zest and juice and joie de vivre intact, a lemon that must be a close relation to one of my own heatwave standbys, namely homemade lemonade. But under that citrus-y sunshine lies a verdant bite of herbs and an earthy, shady vibe from the Atlas cedar that on my skin is apparent from first to last. As it softens and fades, I detect a seamless aura of neroli and orange blossom (never, ever a bad thing in my book), a whiff of background rose and a whisper of lavender, but they’re very hard to tease apart unless I close my eyes and concentrate. As it evolves and moves forward, the lemon stays in the background like a heartbeat in tandem with that luscious cedar, and it becomes greener and earthier when the vetiver and labdanum arrive treading softly, adding a touch of sunset amber to the greenery. Unlike most Tauers I’ve been lucky enough to try, Cologne du Maghreb doesn’t last much more on me than approximately three hours or so, which is still quite impressive for a cologne. I have generally speaking – apart from a vintage bottle of 4711 I acquired in a thrift store for reference – tended to avoid true colognes (as opposed to eau de cologne concentrations of certain perfumes) precisely because they’ve seemed a bit too simplistic, fleeting and linear for my personal tastes. In some hard to articulate way, they’ve failed to scratch my perpetual itch for Slaying Them With Sophisticated Sillage. Now, with Cologne du Maghreb, Andy Tauer has upended all my preconceptions of what a true cologne can be, by making a cologne for the rest of us perfumista diehards. It is not boring, not simple, not clichéd or trite in the slightest. Instead, it is the closest thing to bottled air conditioning I’ve tried all summer. While I very much doubt Cologne du Maghreb will cure bubonic plague like those famous waters of Köln, it certainly cures any summertime heat blues I might have. I’ll be buying a bottle as soon as I possibly can. Notes: Lemon, bergamot, clary sage, rosemary, orange blossom, lavender, neroli, rose, Atlas cedar, labdanum, vetiver and amber. Cologne du Maghreb is available from First in Fragrance and Luckyscent. Disclosure: A sample was provided for review by Andy Tauer, for which I can’t thank him enough. Also special thanks to Jeffrey Dame and to Andrew Millar, who suggested a cure for my long and debilitating case of writer’s block.